Home Dinosaur Drawing a ‘curtain of fire’ on dinosaur extinction theory? The role volcanic activity played in mass extinction events in the Earth’s early history is likely to have been much less severe than previously thought, according to a study led by the University of Leeds. Asteroid impacts and long-lasting volcanic eruptions called continental flood basalts—the two most commonly cited possible causes of mass extinction events—would have propelled gas and dust into the atmosphere and altered climate for years. But, until now, the impact of years of sulphur dioxide emissions from continental flood basalts was unknown. In a study published online today in Nature Geoscience, researchers have provided for the first time a quantitative estimate of the degree and nature of the effects that such eruptions had on the Earth’s climate, vegetation and oceans. 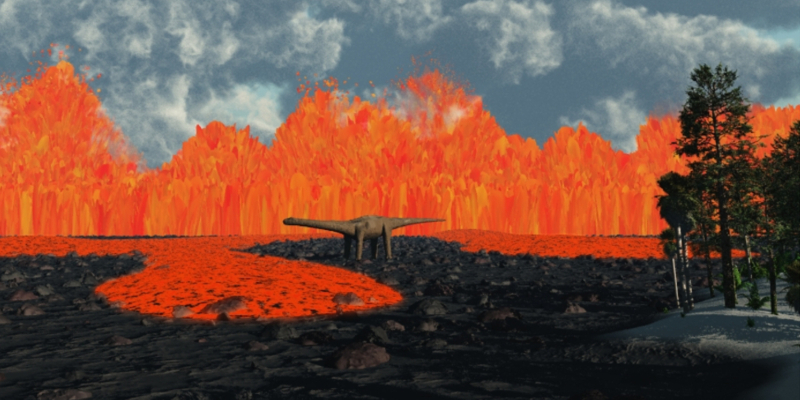 Study lead author Dr Anja Schmidt, from the University’s School of Earth and Environment, said: “At the time when the dinosaurs reigned, numerous long-lasting eruptions took place over the course of about a million years. These eruptions, called ‘continental flood basalts’ were not like volcanic eruptions we often see today, with lava gushing from the ground like a curtain of fire. In the new study, the researchers used a sophisticated computer simulation of the spread of the gas and aerosol particles, which showed that the climatic impacts of flood basalts was less grim than scientists had previously suggested. They found that only if such flood basalts oozed for hundreds of years, without interruption, may the climatic impacts have had a severe effect on plants and animals. The researchers used information on the duration and intensity of continental flood basalt eruptions, such as the Deccan Traps eruptions 65 million years ago, which covered one-third of what is now India, to estimate the climatic and environmental effects of the huge quantities of sulphur dioxide gas emitted by these eruptions. Their computer simulation showed that temperatures on Earth were indeed cooler as a result of the eruptions—by as much as 4.5 degrees Celsius—but that the temperature would return to normal within 50 years after an eruption ceased. Dr Schmidt noted that the conclusions are based on the assumption that climate feedbacks were very similar to those today. “Perhaps most intriguingly, we found that the effects of acid rain on vegetation were rather selective. Vegetation in some but not all parts of the world would have died off, whereas in other areas the effects would have been negligible,” said Dr Schmidt. The new findings will challenge the earth sciences community as a whole to re-examine the causes of mass extinctions and the role of volcanism. “We now need to better understand how long both the individual eruptions and the periods without volcanic activity lasted,” concludes Dr Schmidt.